The Central Board of Secondary Education (CBSE) conducts the National Eligibility Test (NET) twice a year to determine the eligibility for lectureship and for award of Junior Research Fellowship (JRF).. Description:This book, titled REASONING TEST, has been developed, keeping in mind the increasing significance of reasoning as a major subject of study for various competitive examinations, a..
ContentsEk Parichay;Asmaan Akriti Parikshan;Samaan Akriti Parikshan;Smriti Parikshan;Sankshipt Raasta Khoj Parikshan;Eint Parikshan;Haan ya Naa Parikshan;Anko par Aadharit Parikshan;Taalika Parikshan;..
A comprehensive Book on Railway Aptitude & Psychological Tests. This book is very useful for the Centralised Recruitment of Assistant Station Master, Traffic Assistant, Assistant Loco-Pilot, Diese.. 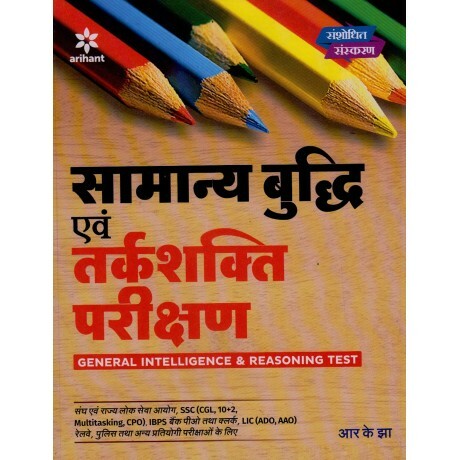 The Union Public Service Commission (UPSC) conducts the IAS Mains Examinations with an aim to assess the overall intellectual traits and depth of understanding of candidates rather than merely the ran..
About the BookUseful ForTable of ContentKey Features This revised edition of A Modern Approach to Verbal & Non-Verbal Reasoning, while retaining the key strengths and structu..
ContentPart - I. General Awareness1. General Knowledge2. General Science3. Computer KnowledgePart - II. Mathematics1. Number System2. Percentage3. Profit & Loss4. Partnership, Ratio & Proporti..